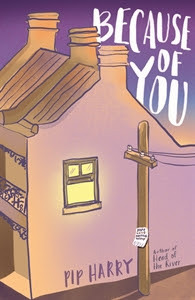 Tiny is a homeless girl in NSW, one amongst the many people who ‘reached for the champagne, but ended up with a fistful of broken glass.’ She carries with her a broken heart as well as a broken home. The well-educated but also homeless Zak, becomes her street dad and protector. Nola has broken up with her boyfriend Tom over a trust issue after he discovers she hasn’t told him about her gay parents. She is doing her HSC year, and must volunteer at a homeless shelter to get her final points. Tiny and Nola meet at a small writing group that provides a creative avenue for the homeless at the shelter, Hope Lane. The two lives come together in an unexpected way and both are changed through their shared experiences. Pip Harry has chosen strong social issues to address, using her original prose style and impressive turn of phrase throughout the novel. The clear and descriptive settings draw the reader into the space that the characters occupy. Pip shows us the sad and hopeless side of homelessness; the reasons why people become homeless, and the many emotional, psychological and health problems they face. She also shares the stories of the generous hearted volunteers and tireless workers who attempt to improve the lives of the lost and forgotten. I loved this book. It is built on many themes that include homelessness, how we perceive others and how they really are and why, and the power of friendship and change. It’s about storytelling (of which there is a great deal in this moving book), and sharing lives, and how kindness and interest can repair the broken and re-form the future.